It was early in the morning and since Mommy had just left for work, it was time for Daddy to take the stage for my daily variety show. Although I’ve been known to perform intimate acoustic Disney-song concerts, reproduce Van Gogh’s “Starry Night” on the Magna Doodle, and even regularly scare the robotic tigers my son has imagined into existence back into “other houses, but not this house,” I was feeling especially wiped out on this particular morning. The Twins had just gotten over a nasty cold, and had so generously shared it with me, so as I sleepily hacked up a lung, I decided I needed a power-up and fired up our Keurig (arguably the best purchase we have made as new parents). And yes, I realize that coffee is not a fantastic idea when one has a cold, as it discourages hydration, but when one is accustomed to caffeine every morning, one is inclined to not pile the withdrawal headache on top of fiery sinuses and a gravelly throat. So there. This is a new fun game I play with my daughter. She recently has become enamored with the novelty of playing with all of her toys with Daddy in her room. So much so, in fact, that every moment of every day I am home with them, my presence is requested in her room. And so I tell her “No,” invariably triggering a hissy fit which lasts way longer than it needs to. In fact, just the other day, I was rocking The Beatles’ Help! on vinyl at my son’s request (yeah, he’s pretty awesome), and in the middle of the opening title track, my little girl invited me to play in her room. After I explained that Daddy and Brother were busy doing Awesome Things, she staged a very vocal protest spanning almost all of Side A. On a side-note, my resilient son didn’t let the screaming infringe upon his Beatlemania, and he just kept literally dancing circles around his sister as she kicked and punched the floor. Fortunately for all parties, on this particular morning my son was preoccupied with a book, so Operation Oh Please, God, Don’t Let My Daughter Flip Out While I Feel This Terrible was all systems go. “Okaaaaay,” she sang. “You bring your coffee in my room, too.” Even at two and a half, the Twins have learned how important it is to wait for Mommy and Daddy to get coffee at all times, a parenting tactic I highly recommend. 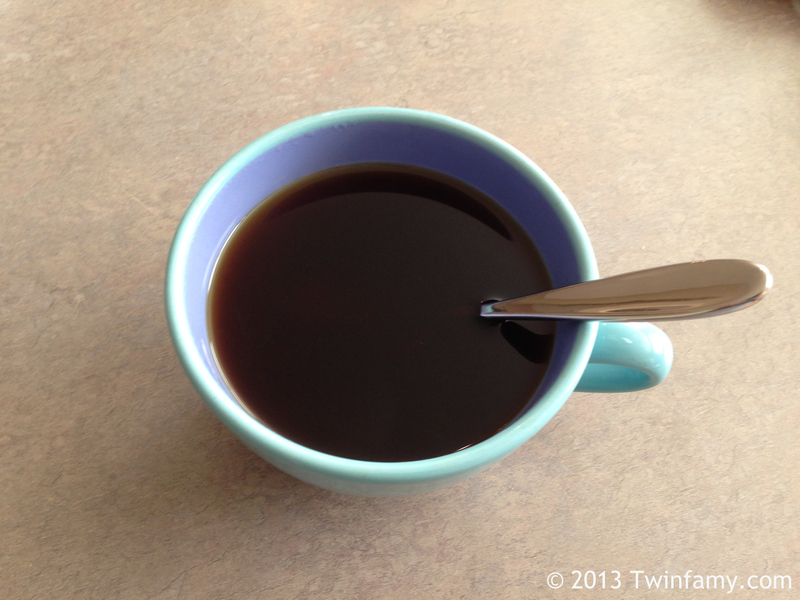 I pulled the warm mug from its place on the Keurig, added some sugar, and, grabbing a spoon, began to stir. “That’s not nice,” she grimaced. I was simultaneously baffled and entertained. It’s not nice to stir my coffee? This was going to be good. I just knew it. “Why not, baby?” I probed. As a parent, there are times when you see glimpses of yourself and your partner in your children, particularly when they turn your own rules back around on you, and as my daughter reprimanded me with the exact intonation and body language my wife uses on her, I just lost my mind laughing. By the time I stopped, the window for explaining myself had essentially closed, so I figured I’d let this one go and take a stab at it the next time I “played with” my coffee. Mug in hand, I followed my daughter as she skipped elatedly into her room, where we played for about 30 seconds before my son appeared in the doorway. 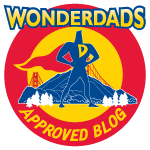 This post was Freshly Pressed by WordPress on August 26, 2013. Hip Hop Hooray! If not, don’t play with your food. Yeah, I’d imagine it’s about the same with multiple kids of different ages, too. It’s nice to be wanted, but the almost-constant argument kind of takes away the glow. We see that often over here. Glad to hear I’m not the only one. How old are yours? They just turned four. I never let my kids taste anything of mine when they were little. If they even wanted my pop I would pour some in the cap and they still remember that. Now they see me letting the twins drink, lick, and bite anything I have and they can’t believe it. I think now that I am old it just doesn’t matter anymore. Yeah, age can definitely be a factor. I also feel like I’ve aged a lot quicker since I’ve had kids. I got more gray hairs in their first year than the five years before it combined. Hey, kind of like the president! Haha, yeah, I guess it’s similar to that. My girls are four, and oh is this familiar! It sure goes by fast. My girls sing, “I love coffeeeee, I love coffeeeeee” just like their mom. It’s a VITAL part of the morning. I don’t think I ever drank a cup pre-twins. Brilliant! Particularly enamoured of the old hacking up a lung routine, and the hissy fits! My sisters may be 28, but believe me, I can relate! We’re like an awesome trio, but there comes a time when we have to split. And the split usually means I’m half on one side, and half on the other. That usually happens on their birthday. I yell: YOU’RE BOTH BUYING THE SAME THING FOR EACHOTHER. And then they huff and glare at me together. That’s pretty funny. I’ve heard about this dynamic when Twins have an additional sibling. As close as twins tend to be, I can imagine there are times you just can’t win. So you know what a tug-of-war rope must feel like… Funny. My kids are Beatles fans too. I feel it’s my duty to educate them in the classics. “I wanna hold your hand” is their favourite at the moment! This sounds like my “twin narrative”, although both me and the wife work. Toddlers are clever. 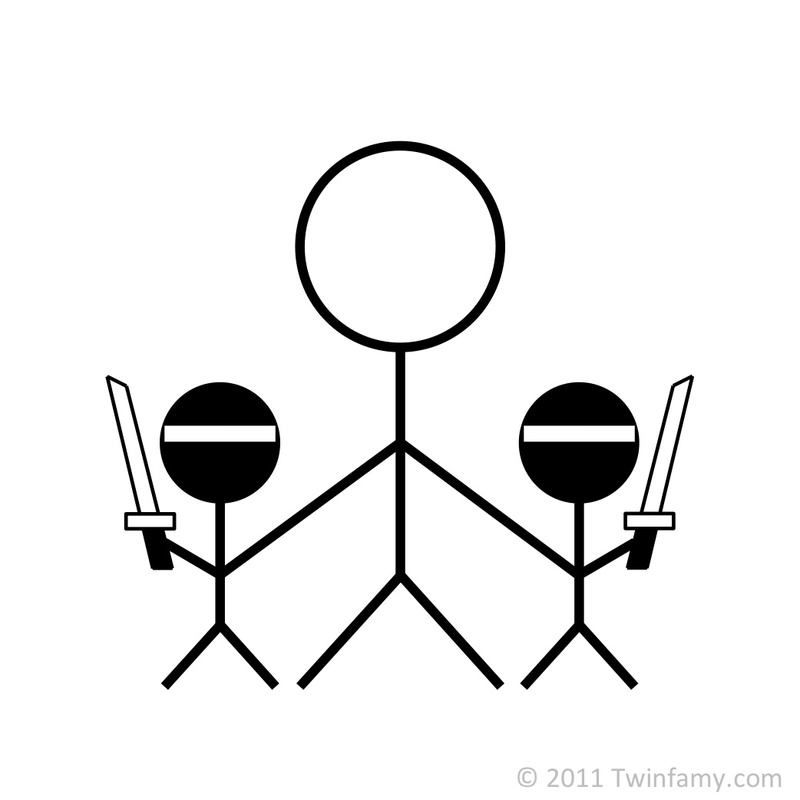 And when you are dealing with twins, well…you know. Yep, mine are really starting to band together and conspire against me. I’m in trouble. I feel like I could perfectly envision your daughter’s face when she told you not to play with your food. My (almost two-year-old) nephew can give the dirtiest looks if he so chooses, especially if I won’t pick him up and show him his beloved cuckoo clocks. (Which he asks to see by “cuckooing” at us until we cave in). Toddlers are experts at the death stare. I think they all have a secret chat room where they share protips. A great read and hilarious. I hope when I have kids that they’re as entertaining as yours! Thanks for sharing such a great, honest story of parenting. Yeah, I actually have a dog, too, so she’s a third little being competing for my attention. I feel like a rock star. Lovely sentimental snapshot, with a spoonful of sugar and a rich sense of humor. Perfect! Well, I don’t know about that. I’d venture to say double just means twice the intensity. It means both double trouble and double awesomeness. It just depends on what’s happening at the moment. Absolutely adorable. Kids that understand the importance of coffee AND the Beatles?? There’s hope for humanity! Right? I’m so proud of them. It’s the moments like that which can almost make you forget how miserable you feel, isn’t it? And I agree, the kids must know that nothing happens before coffee! Haha! Yep. I often find that the moments I feel like I’m spiraling downward or second-guessing myself or physically hurting are the very moments the Twins decide to be hilarious. It’s a good gig. Just came across your blog due to Freshly Pressed. Love it, nice work stay-at-home trophy husband! I miss them so very much. Enjoy the mayhem, it’s a beautiful blessing disguised as an exhausting effort until you wake to find that life has sped faster than you thought possible. Agreed. It’s already happening so fast. I feel very fortunate to have spent so much time home with my kids because a lot of dads don’t get that opportunity. Trying to soak it all in and appreciate every moment as much as I can, because like you said, they’re not this age forever. Holy crap! How did you make it? Tea? Red Bull? Vodka? Are you a superhero of some kind? Nerves of steel I guess! Yep, definitely a superhero. Nerves Of Steel Woman–able to tolerate annoying children in a single bound! I once read somewhere that W.C. Fields, while making a movie with a toddler, actually put Vodka in the child’s bottle to “quiet” her down. Hmm.. what did you say you were stirring in your coffee..?? LoL Children learn by imitating and repeating.. That, sometimes, can be hilarious..!! :) Very Much enjoyed your post. Great story-telling. I’m proud to say I’ve never spiked my coffee. I gotta be on my A-game if I’m gonna make it all day with these two. Thanks so much for reading! Playing with your coffee! Awesome. I’m telling Mom! I thought you should have gotten scolded for added sugar too. That’s true. I really ought to cut back. I might get a cavity. Very charming. And, I’m glad I’m not the only one who will reach for a cup of coffee even when sick. It depends what it is for me. I’ll usually skip it if I have a stomach bug, but if I have a cold, it’s game on. Haha this is hilarious. I like your style. Children are wonderful little creatures. After I’ve had my caffeine hit. Great blog, my friend. I’m a father of 15 month old twins; boy and a girl. Not a stay at home dad (at least not yet). Don’t know how you do it (LoL). I get the same thing with my NSA co-workers. I’ve been enjoying your blog for a while and I was really glad to see you featured on Freshly Pressed today. Way to go! Kids really do have impeccable timing. Its pure instinct. They can sense relaxation from a mile away, that’s when they make their power moves. Thanks so much! Yep, they do seem to have a sixth sense, or at least pay way more attention than we give them credit for. I can relate to the glimpses of yourself in your children. Sometimes I feel they are like mirrors. August 28, 2013 - 3:48 am Pingback: Mug of War | ihow. That is so adorable, can’t wait to have kids on my own and congrats on Freshly Pressed! Loved your blogs! Funny story, well told. A friend of mine with grown kids told me his kids can only remember back to when they were 3 or 4 years old. Their first 3 years are lost to the mists of time. My friends theory is such forgetfulness in children is by design — it gives us parents a couple to make mistakes without consequences. I don’t know. But it sounds like you’re off to a good start with your two. Good luck and keep on writing. Thanks! That’s an interesting perspective, and it makes a lot of sense. It’s probably a good thing that our kids can’t all remember so far back, because–as evidenced by several of the posts on this blog–I’m definitely making it up as I go to some extend and am not without mistakes. I don’t know about there not being any consequences, but I guess it does lower the stakes a little in the event of a screw-up. Aww, I loved this. What a nice way to end my night…knowing I will go through the same thing with my three year old daughter in the morning! THIS morning I made coffee and she made me play Candy Land with her before I left for school, but I am glad it was not in her room! Thanks so much! I actually love that desire they have to play with me. Although I’m not always up for it, I remind myself that it’s not always going to be there and when they’re teenagers they’re going to want me to get lost. Still, though, I could do without the tug of war. Love the posts and thoughts on a dad raising twins. I have fifteen month old triplets and am looking forward to the experiences your blog about! Wow, triplets? Kudos. My wife and I always talk about how with the Twins, at least we can each hold/chase/take care of one. But with triplets, you’re kind of outnumbered. Of course, you also have triple the awesome, so I guess it works out.